A one‐dimensional model is employed to reproduce the observed time evolution of hydrographic properties in the upper water column during winter, between 26 January and 11 March 2015, in a region north of Svalbard in the Nansen Basin of the Arctic Ocean. From an observed initial state, vertical diffusion equations for temperature and salinity give the hydrographic conditions at a later stage. Observations of microstructure are used to synthesize profiles of vertical diffusivity, K, representative of varying wind forcing conditions. 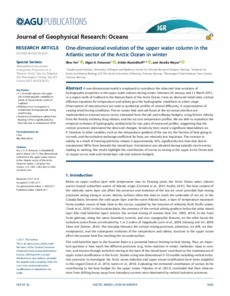 The ice‐ocean heat and salt fluxes at the ice‐ocean interface are implemented as external source terms, estimated from the salt and enthalpy budgets, using friction velocity from the Rossby similarity drag relation, and the ice core temperature profiles. We are able to reproduce the temporal evolution of hydrography satisfactorily for two pairs of measured profiles, suggesting that the vertical processes dominated the observed changes. Sensitivity tests reveal a significant dependence on K. Variation in other variables, such as the temperature gradient of the sea ice, the fraction of heat going to ice melt, and the turbulent exchange coefficient for heat, are relatively less important. The increase in salinity as a result of freezing and brine release is approximately 10%, significantly less than that due to entrainment (90%) from beneath the mixed layer. Entrainment was elevated during episodic storm events, leading to melting. The results highlight the contribution of storms to mixing in the upper Arctic Ocean and its impact on ice melt and mixed‐layer salt and nutrient budgets.